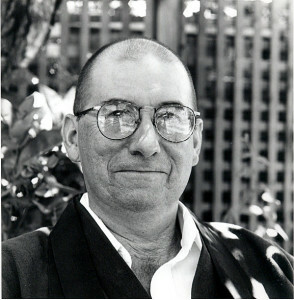 A funeral ceremony for Myogen Steve Stücky will be held at 3 pm on Sunday, February 9, 2014, led by Abbess Eijun Linda Cutts at Green Dragon Temple, Green Gulch Farm Zen Center, 1601 Shoreline Highway, Muir Beach, California. (The Obonsho, or bell, begins at 2:45 pm.) A reception will follow the ceremony. Please carpool, as parking is limited. In lieu of flowers, and in accord with Steve’s wishes, the family suggests that donations may be made to San Francisco Zen Center’s Widening the Circle Capital Campaign, on the web at imagine.sfzc.org, or mailed to the address below. Comments to the family or Zen Center are also welcome on the Subtle Eye blog, or by mail. A cremation ceremony was held in Sebastopol today, led by Sojun Mel Weitsman. The entire assembly had a chance to circumambulate the coffin once and offer flower petals or incense while chanting the En Mei Jukku Kannon Gyo (invoking compassion). 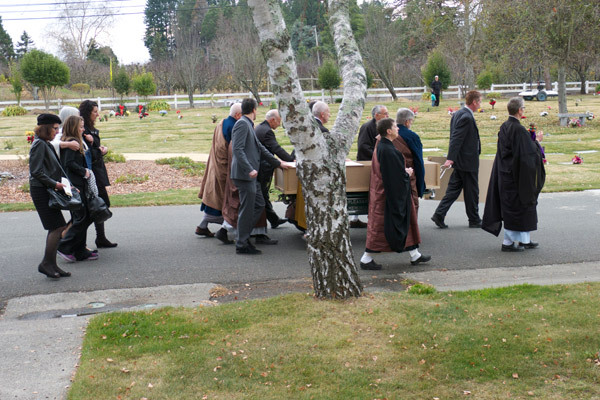 The photo below shows the procession from the chapel to the crematorium toward the end of the ceremony. The group chanted as they went: "May you be free from suffering and at peace." During this time the assembly remained in the chapel in silence until those in the procession returned, upon which we chanted the Heart Sutra. In addition to these chants, copies of Steve's death poem were available at the service (downloadable PDF). As is our tradition, memorial services will recur every week until 49 days after the death. At City Center, the morning service will be dedicated to Myogen's memory every Tuesday at 6:40 am until February 18. Posted in Uncategorized on January 6, 2014 by Jay Pennington. I want to thank both Mary and Jay for faithfully recording the most moving and inspiring illness and death of former Abbott Steve. Being so close to events has been a deep and teaching experience. With much sympathy to his dear wife and children. My own father died within a few short months of being diagnosed with cancer, so I truly know how sudden and how shocking this must be for all who knew and loved him. And I know it must have meant a lot to Myogen Stuckey to be allowed to die among friends and family, and to be allowed to die with dignity. He has shown, through this blog alone, that he has met both life and death with grace and peace. He's an inspiration to us all. I am deeply saddened by his passing, but I am grateful for having heard him teach, even if it were only online.